In Chinese Medicine, Tea is considered the king/queen of all herbs. It as been used for thousands of years to nourish and appreciate the human experience. To drink tea grown from a trees over 500 yrs old is truly an exquisite experience. A tea ceremony includes many aspects; the proper set up, living tea, clean water, spacious environment and quality utensils. Most importantly though, the ceremony creates a powerful container for appreciation and connection to ourselves and each other. A nourished belly, heart and soul helps one to feel fullfilled in life, ready to take on challenges and deepen lifes purpose and service to our world. 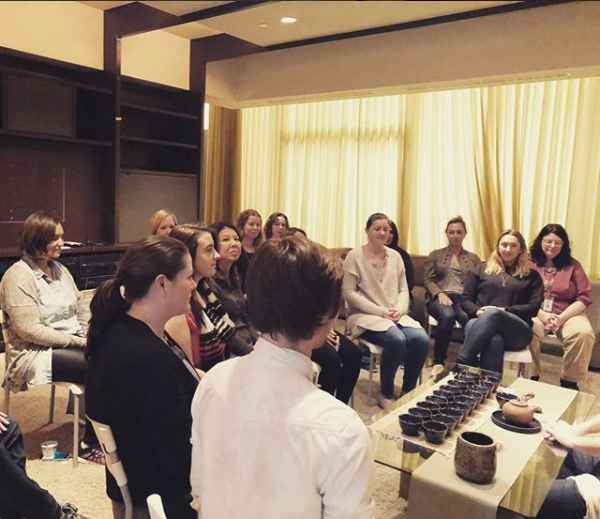 Cha Dao Tea Ceremony is an immersive wellness experience that cultivates deep awareness and centeredness through communion over tea. Together we create more peace, a better understanding of self, and practice mindfulness. Cha Dao is a way of living life in which we know ourselves better through the skill of serving tea and honoring this timeless art. The Teas are of the highest quality, ceremonial grade, and are harvested from wild, old growth tea plants. The availability is extremely limited and irreplaceable. To experience these Teas is an honor and a special opportunity offered to very few people on Earth. Tea ceremony can be a wonderful and introspective journey, a meditation on beauty through the synergies of flavor, smell, and taste. To drink tea among friends under the right circumstances magnifies the sensations of the tea, making it easier to see the beauty that tea has to offer. Second, tea connects us to ourselves.